I had breakfast yesterday with an old friend who is interested in architecture and urban development (and redevelopment). We bounced around an idea related to charter cities, a topic I’ve written about here before (see here and here), but with a twist. Specifically, we considered how preexisting cities could use something akin to the “charter city” model to promote redevelopment—given that local politics can be as much of a roadblock at the municipal level as at the sovereign level. Think of it as extreme zoning: A city could charter a specific area (say, a space dominated by shuttered factories). The municipal government could then, essentially, give the area a clean slate from a regulatory perspective (low taxes, incentives to lure businesses and investment). A task force would then work directly with an architecture firm and with potential clients in order to craft a new, business-friendly charter area, perhaps in line with a road-map provided by the city (in terms of desired population density, industry preferences, etc.). In the long-run, such a project might well pay off several times over for the city, given that the boost to GDP and spending would not be confined to the economic zone. To a degree, this model already exists. Some countries have accomplished a similar end through the construction of special economic zones, though typically the space appropriated for such projects does not come from urban areas. Countries with strict social laws have also formed business zones where those laws do not apply—on a recent trip to the U.A.E., I was impressed by one such zone, the Dubai International Financial Centre. Could a twist on this model be applied in ailing American industrial cities? Detroit? Pittsburgh? I compared this chart to another one mapping overall state debt per capita. What struck me as most interesting about the two charts is the odd, bifurcated correlation between them. Having a high level of state debt seems to correspond with having extreme credit scores—on both extremes. 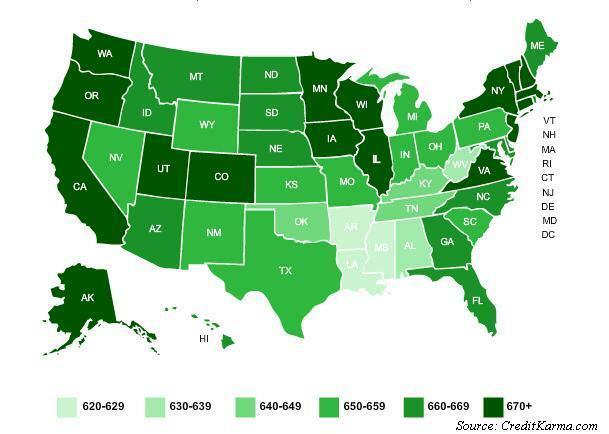 Some states with high debt levels have extremely prudent consumers with high credit scores. Some have consumers with extremely low scores. Virtually none have “average” consumers. For instance, New York (average credit score 676), California (681) and Illinois (681) are among a handful of states with the highest average credit ratings in the country. The national average, at 664, is well below the averages in any of these states. But look at the chart below. California, New York and Illinois are also among the states with the highest state government debt. 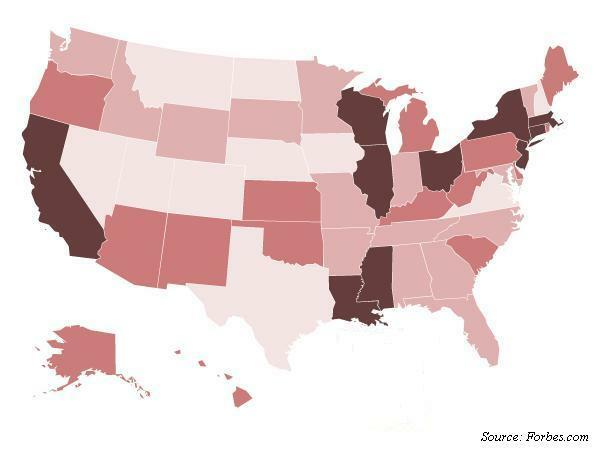 Four other states—Wisconsin, New Jersey, Connecticut and Massachusetts—exhibit the same pattern of high average personal credit scores plus a high level of state debt. But the other states with high per-capita state debt levels display precisely the opposite pattern—extremely low average credit ratings. Note, for instance, Louisiana and Mississippi. There is only one state in the middle ground: Ohio, which has very high state debt but where average credit scores, at 658, are roughly the national average. I’m curious for thoughts about this discrepancy. I don’t see why state government spending should necessarily have a positive correlation to personal debt levels or personal credit scores, but neither do I see any reason why it should be inversely correlated. It’s interesting, and perhaps revelatory, that the high-debt/high-scores states tend to be those with big cities. But does anyone have thoughts on why high state debt might correlate to both extremes? 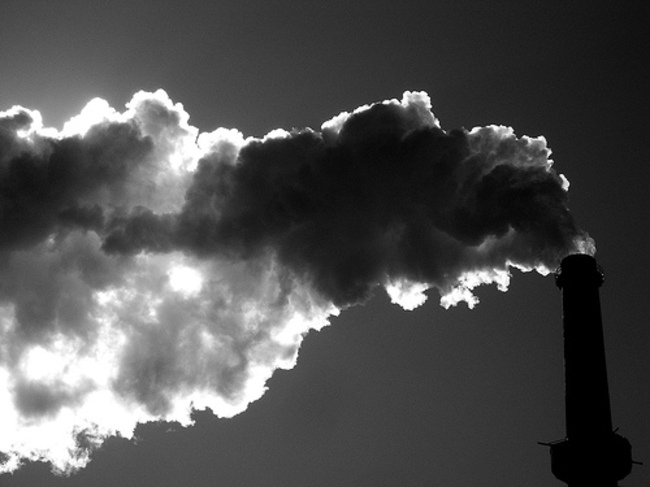 How Would Banks Play Carbon Markets? At least in the beginning, when the carbon market will be dominated by electric utilities (the market would launch for utilities in 2013, then would expand to manufacturers in 2016), banks will play their biggest role either providing liquidity as market-makers, or helping companies hedge against swings in carbon credit prices and thereby manage risk. At this point, competition to trade carbon credits would be dominated by two exchanges: the ICE (Intercontinental Exchange) and The Green Exchange, which is part of NYMEX. In terms of pricing, the climate legislation currently bubbling in Congress sets a price floor at $12/ton of carbon emissions and a price cap at $25/ton. At least in the beginning, Sikorski says, Barclays is expecting prices at the bottom end of that band. Longer-term, I’m curious how the financial sector will interact with this (potentially rapidly expanding) market, and particularly the degree to which speculators will get involved. Will we see carbon ETFs, for instance, or significant hedge fund activity? And if so, what would the practical effects be on utilities or manufacturers looking to hedge themselves? Carlos Slim, the Mexican telecoms magnate, recently became the World’s Richest Man, according to the new Forbes Billionaires list. This is not the first time Slim has held the title. He briefly became the WRM in early 2007, slightly before mayhem broke out in the credit markets, at which point emerging markets were riding high. Emerging markets are again riding high, and onlookers have been speculating for months now about whether a new bubble might be forming. Not to be cute, but it’s not unreasonable to watch to see if there’s some loose correlation here. Clearly, Slim’s fortune mushrooms when emerging markets post strong growth — and perhaps it peaks when price levels are getting a little heady. Were market conditions to rupture, I don’t think credit markets would be the epicenter this time, so I’m not suggesting new problems would mirror those of 2007-2009. All the same, however, it’s worth considering whether the Carlos Slim Indicator might have something to tell us about the valuation of emerging market assets, and what that in turn might say about the trajectory of asset classes more broadly. In response to yesterday’s post (which, to my excitement, got picked up by FT Alphaville), a friend sent me the following chart. It shows FAS and FAZ, Direxion’s leveraged ETFs tracking, respectively, the daily performance of the Russell 1000 financial services index and the inverse of the same index. Both ETFs are 3x leveraged, and as you can see, they have both fallen significantly thus far this year — FAS by around 30%, and FAZ by nearly 100%. My friend pointed out that there would be an easy arbitrage play here if you could simply short both of these ETFs at the same time. Unfortunately, while you can short an ETF, it would be difficult to short sell a leveraged ETF in practice, because you’d have to find somebody to lend it to you — and most brokerages serving retail investors won’t do this, presumably because they understand that the deal would likely net them a loss in the long-run. One caveat: even if you found somebody willing to lend you shares of both FAS and FAZ, so that you could sell them short, the success of this arbitrage strategy would still depend on the volatility of the market, as this post on SeekingAlpha points out. The author, Larry MacDonald, encourages anyone trying this strategy to seek out leveraged ETFs in the markets most likely to be volatile over time. I’ve written about this before, but I feel it bears more coverage, and with one notable exception (Izabella Kaminska at the FT) nobody seems to be paying much attention. The ETF market strikes me as incredibly ripe right now for abuse (or confusion, at very least), given public interest in investments that seek leveraged or inverse returns, or both. There is a flood of new synthetic ETFs that might strike retail investors as logical vehicles through which to do this, but they are not what they seem at first blush. Here’s an example. The following chart from Google Finance shows the S&P 500 index over the past year (the red line), and next to it the ProShares Short S&P500 index over the same period (blue). An investor buying such a product might logically assume that it would track the inverse of the S&P. You’ll notice in the chart that the S&P is up a little under 10% for these 12 months, so an investor might assume that the ProShares index mapping its inverse would be down roughly 10%. In fact, the ETF is down roughly 30%. The discrepancy in returns comes, in large part, from how these sorts of ETFs work. Unlike buying a stock, which has a set value correlated to the value of a sliver of a company (i.e. it’s pegged to something that represents actual value, even if what that value is can be disputed), the NAV prices of ETFs are somewhat arbitrary. They “reset” after each trading day, and only seek to track their benchmarks for that day, not over the long-term. Here’s what this means in practice. Say you buy one share of an ETF for $100/share. The ETF seeks to track the inverse of Stock Index A, which is trading at a NAV value of 100. On the first day, Stock Index A rises 10%, to 110. The ETF, assuming it tracks its daily benchmark perfectly, falls 10%, to $90/share. Then, on day 2, Stock Index A gains another 10% (or 11 points — 10% of 110). The index closes the day at 121. The ETF, meanwhile, loses 10% of $90, or 9 points, and falls to $81/share. Now, on the third day of trading, Stock Index A falls to 100. So it lost roughly 17.4% of its value. The ETF tracking the inverse gains the same percentage, or ~17.4%. But 17.4% of $81 is $14.06. So the ETF only rises to $95.06. Result: The index winds up even after 3 turbulent days of trading. The ETF, however, has lost almost 5% over the same period. The longer you hold a leveraged or inverse ETF, the more magnified this discrepancy becomes, even if the ETF is executing its daily objectives perfectly. The key point here is that investors should be aware that these tools are not intended to map the inverse or leveraged returns of their benchmarks over long periods of time. This fact is easily lost on novice investors, particularly given that details about how ETFs actually work do not often play a prominent role in the advertisement of these products. Are Spaniards Immune to Cigarettes? The Economist posted a chart today showing which countries have the highest number of smoking related deaths, as a percentage of total deaths of people over 30. I found the chart fairly surprising–I knew per capita smoking rates were incredibly high in countries like China and Russia, so it surprised me that smoking accounted for a comparatively smaller percentage of deaths there than in the United States or Canada, which are known for having lower smoking rates than even western Europe. So I looked up global per capita smoking rates (measured in number of cigarettes smoked by an average adult per year). Sure enough, the levels don’t track very well with the death rates. What I suspect accounts for the difference is the fact that many causes of death in places like China and Russia are easily treated in the United States–a factor which theoretically could spike the percentage of deaths from smoking. The obvious counterargument is that treatment for smoking-related illnesses should presumably also improve in developed economies like the United States. Perhaps these types of illnesses are simply less treatable, even under the best of medical circumstances? Another confusing wrinkle is Spain. Compare Spain to the United States. Note that Spaniards smoke far more–but a far lower percentage die of it! Are they dying of something else? Or are they just immune to cigarettes?! An interesting question came up at a meeting I went to the other day: Why has the yen carry trade shifted so profoundly to a dollar carry, when it seems probable that the United States will have to raise interest rates before Japan will? A few people mentioned liquidity, but clearly there is enough yen liquidity to support an active carry trade, given that the yen was, for years, the primary vehicle for carry trade borrowing. Another argument, which one of my colleagues mentioned, is that markets are nervous about the new Japanese government launching an intervention to stabilize the yen. That’s interesting. I wonder how long it will take for the new government to reassure traders that this isn’t the case–and then if we will see a re-reversion back to the yen carry. I came across the following chart today. It shows how dramatically Chinese oil consumption has outstripped Chinese production over the course of the 2000s. What Does the PE Selling Spree Mean? I’m not sold on this point. The most convincing support of the FT’s argument that Blackstone is now more economically optimistic is the fact—buried deep in the article—that Blackstone is also buying three companies. But even so, the company is selling far more than it is buying. Why not conclude, instead, that Blackstone is trying to cash in at what it perceives to be the top of the rally? You could make the same argument, incidentally, about Kohlberg Kravis Roberts’ looming IPO. Doesn’t this echo Pete Peterson and Steve Schwarzman’s (very prescient) move to list Blackstone back in 2007? Peterson and Schwarzman sold their firm at the peak—then the markets crashed. Perhaps KKR is making the same kind of bet (and Blackstone is doing the same by dumping a bunch of companies right now). If I’m right, this news isn’t nearly as reassuring as the FT makes it out to be.